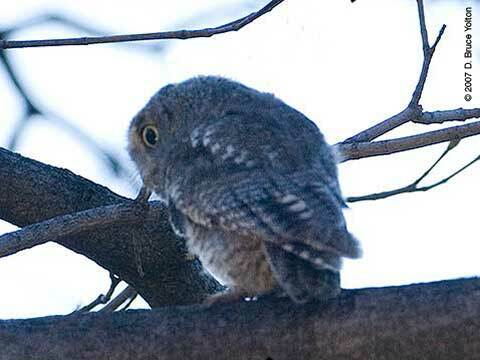 After all of the problems with the West Side Screech-Owls in the Spring of 2006, I wasn't optimistic that there were any surviving Screech-Owls in the park. 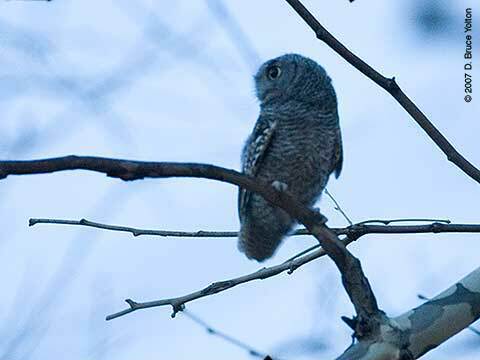 Around Thanksgiving, after the leaves had fallen from the trees, I searched all of the known Screech-Owl cavities near the Rambles and in the North Woods. 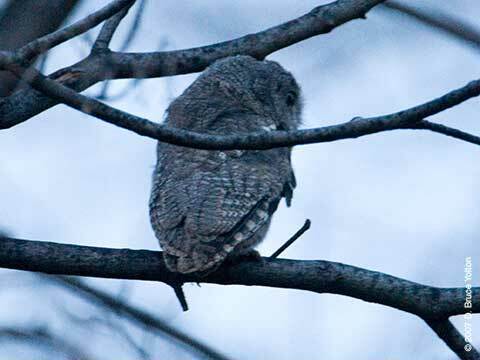 I had no luck finding any owls, and even wrote in my blog, that I though 2006 might be the last year Screech-Owls were seen in Central Park. 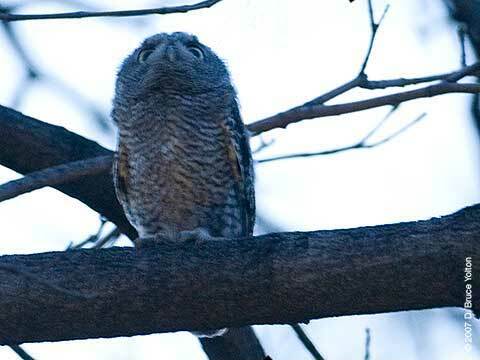 In December, I received a note from Christine (Chris), who walks her wonderful dog Fig, in the Northwest of the park every evening that she had seen Screech-Owls. I spent a few evenings looking for them without any luck. 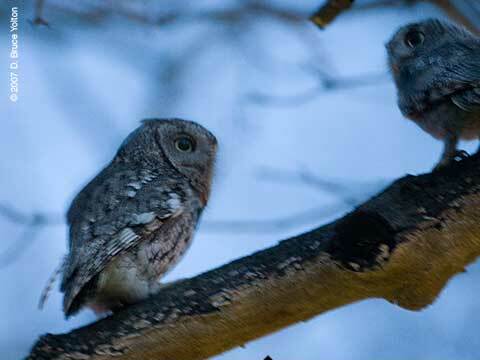 In early March, I received emails detailing two different rescues of Screech-Owl babies up north. Again, I went up to look and found nothing. 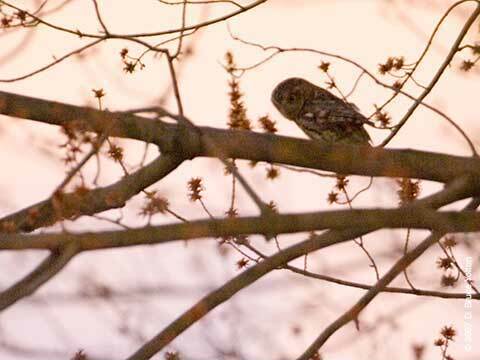 In late March, Chris wrote us again saying she had found the owls. What was wonderful, was that she had not only found the parents, but also a fledgling. 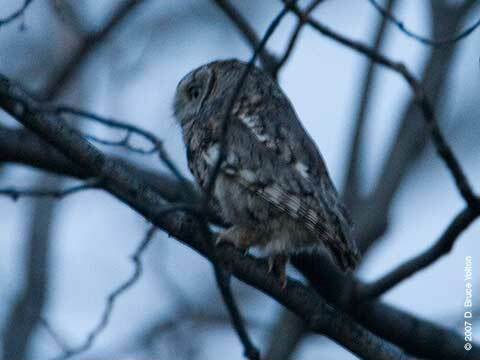 Luckily, the next day, I got to see and begun studying the Screech-Owls. 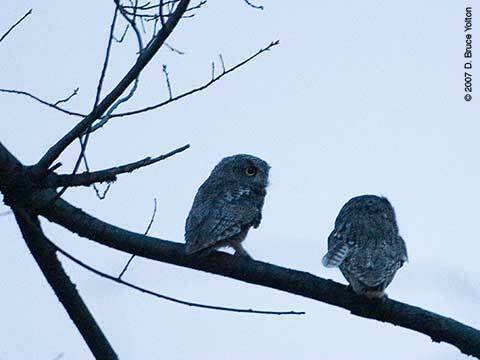 What follows is my account of the adventures and discoveries watching these three Eastern-Screech Owls in the Spring of 2007. These photographs were all taken with natural light. Advances in digital photography make it possible to take pictures in very low light. The photographs were taken with a 500mm lens at distances of 25-200 feet. The long exposures also brighten up the dark sky, so that it appears to be daylight. However, most of these pictures were taken after dusk. As the nights darkened, natural light sometimes was replaced by orange street lamps and green and red traffic signals. You'll notice some color shifts in the photographs or blurry images. To have avoided this completely, I would have needed to use flash. 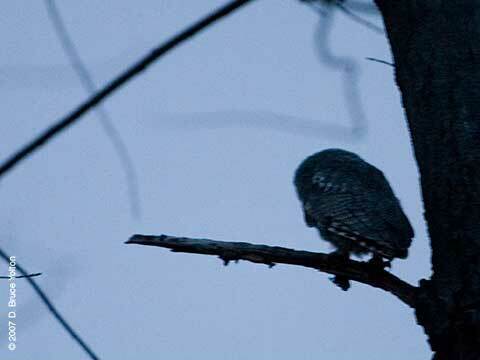 I decided that I would rather have the color shifts than risk disturbing the owls with repeated flashes. I don't think limited use of flash has any effect on the owls, but since this was part of a long term study, I wanted to be extra careful. It's also important to say how much flash photography disturbs the ambiance and those watching with you. When I go birding, if I see a someone or a group watching a bird, I slowly join them before taking pictures. Nature photographers in Central Park should take the same approach, and ask their fellow birders if they mind them taking flash pictures. These birds don't deserve an aggressive "paparazzi" style photo shoot. 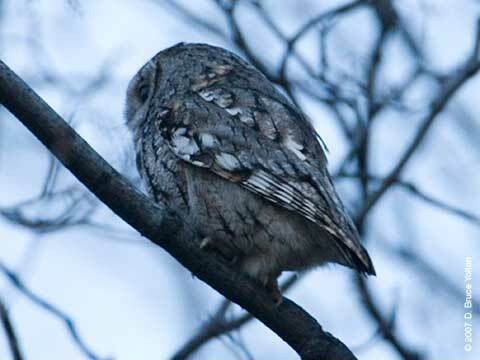 For background on the Eastern Screech-Owl, there is basic information on The Owl Pages or the University of Michigan Museum of Zoology's Animal Diversity Web. 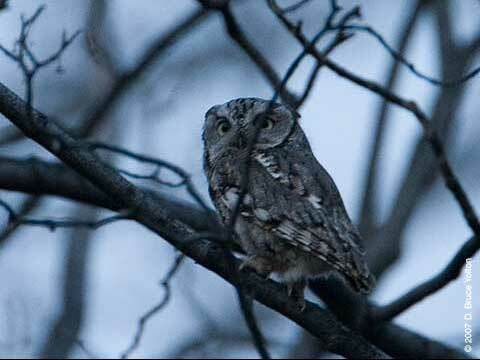 In late February, three young screech owls were found in the northern end of Central Park. Marie was the epicenter of all the email traffic back and forth between rescuers, parks employees, and rehabbers. The young owls were rescued on different days, a pair on one day, and the third on a different day. 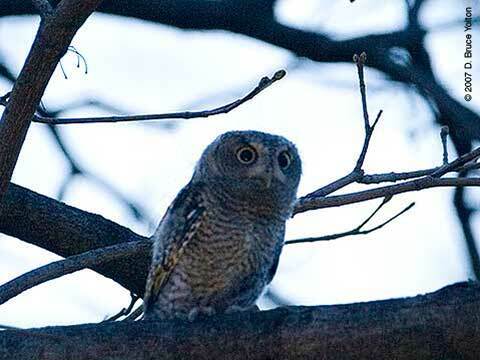 For some reason, lights, plentiful food, that the reintroduced owls came from Rehabilitation and Rescue centers, and/or other factors have resulted in owlets being born a month or two too early in Central Park. 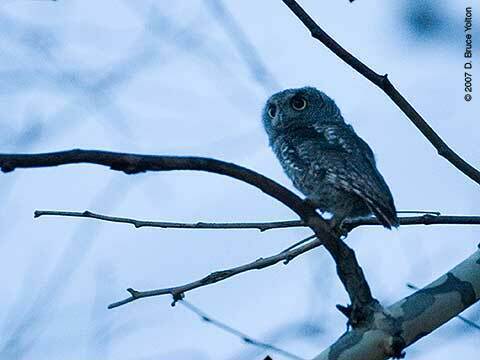 Young Screech owls are "branchers" before they fly, and their early birth when trees are without leaves seems to lead to problems. In case the young owls could be reunited with their parents, an effort to find the parents was launched in case it made sense to reunite the young owls with their parents. 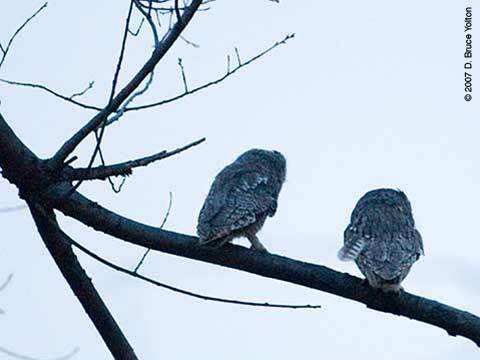 Last year's 75th Street owl watchers went up for a few evenings, but we didn't find the parents and gave up looking. 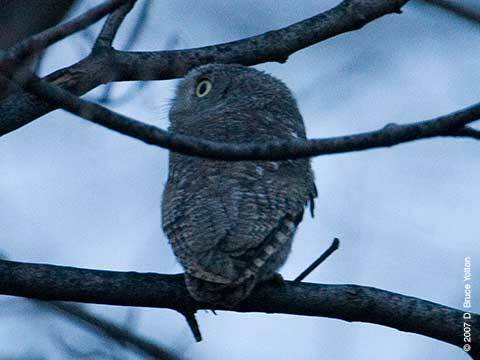 "Positive visual sighting at 9PM of one mature Eastern Screech Owl on bridle path near ballfields, where Bruce Yolton was known to take photographs last year. It flew to a branch within 5 feet of me, perching, without fear, for a good five minutes, responding with little hooty whoops to my whinnying, then flew off. After Chris sent word that she had found the owls again, we all went up north that evening. 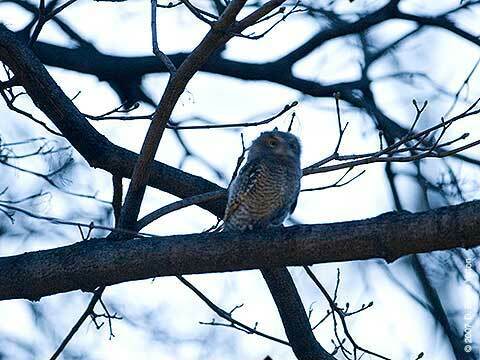 For the first time in 2007, we got to see owls in Central Park. Three owls to be exact, two parents and a fledgling. They must have had four babies. It was great to see both parents and the fledgling doing so well. We were able to follow them as they flew from tree to tree. I was able to get pictures of one of the parents and a fledgling. 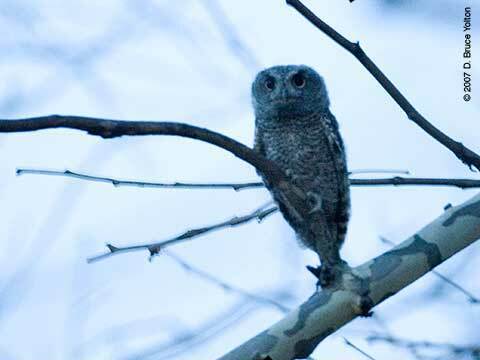 They stopped in a tree that had been used by Screech-Owl fledglings two years ago. It brought back memories of that year, my first season birding in Central Park. 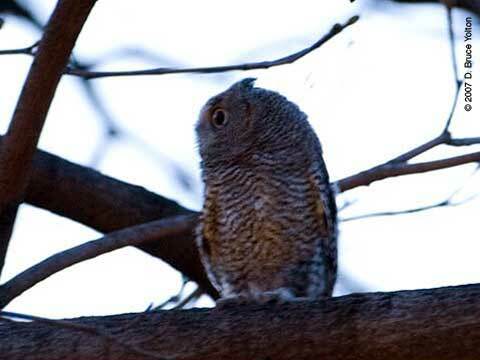 It was the Screech-Owls that year that got me introduced to our current circle of owl watchers. This evening, the fledgling was easy to photograph and watch. We were beginning to learn their perches and habits, but still had a lots to discover. Parent on left, with fledgling on right.